Please note that Continuing Education Credits are not offered for viewing these webcasts. This is the third part of the Academic Career Education Series. Publishing academic work often involves submitting scholarly manuscripts to peer-reviewed journals. A key component of the publishing process involves receiving commentary about your work from peers in your field, and satisfactorily responding to such commentary. This is the second part of the Academic Career Education Series. Between teaching, research, and service, academics fulfill many roles with seemingly little time to devote to each of them. This can leave new and experienced professors alike feeling they are never quite “good enough”. The Dreaded Academic Job Talk: Giving a GREAT ONE! This is the first part of the Academic Career Education Series. GPE is a national program that supports interprofessional practicum, internship, and postdoctoral training in rural and urban settings in underserved communities. 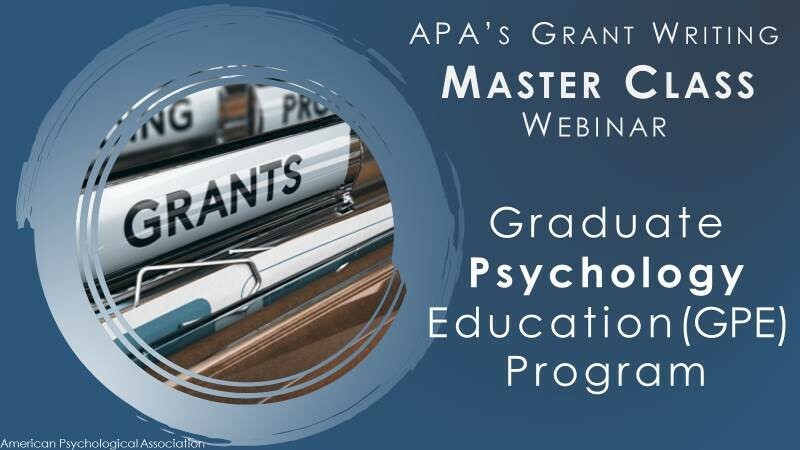 This is a free one-hour webinar to inform the field about the Health Resources and Services Administration’s (HRSA) Graduate Psychology Education (GPE) Program. APA anticipates HRSA will release a GPE Funding Opportunity Announcement for the FY 2019 grant cycle soon.